EZ Coordinator, the year-old transaction management platform from San Francisco-based Sequent Systems, has upgraded the platform to more fully integrate customer relationship management (CRM) into its operation and ad reporting. Now integrated with Google Calendar and Contacts, the email-marketing platform MailChimp and the CRM platform Infusionsoft, EZ Coordinator is attempting to differentiate itself as a seamless lead-to-close solution for residential real estate pros as it has with its established commercial product Sequent Enterprise. The integration with the two Google Apps and Infusionsoft allow for more efficient mobile access to the EZ Coordinator platform, which features DocuSign e-signatures and collaborative document sharing, said Jeremy Shoenig, vice president of product operations at Sequent. “We want to continually add on pieces to the transaction lifecycle on the platform,” Shoenig said. The CRM element of the system, which now features about 3,000 users (of which roughly 30 percent are brokers), came online in January, he said. The update also brings a new reporting dashboard feature that will show info like where leads are coming from, where leads are in the transaction or lead-management process and what commissions look like compared to sales volume over time, Shoenig said. Feedback from today’s rollout will be used to refine those CRM features and add new ones, Shoenig said. In March, Sequent’s marketing firm, Snow Communications, announced that it has invested both cash (six figures) and its services to help Sequent market and develop the EZ Coordinator platform. “The company has an opportunity to stand out,” said Corbin Wood, chief operating officer of Snow Communications. There’ll be a more-formal fundraising in three to six months, Wood said. 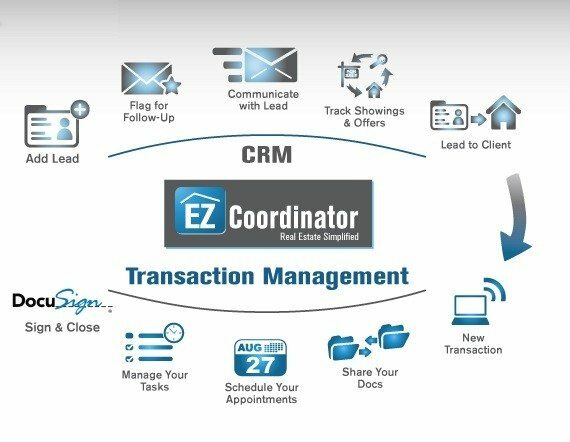 EZ Coordinator has a free version that includes unlimited transactions, document storage and CRM access but does not include e-signature integration and other features. For $20 per month, users get access to DocuSign, Google App integration and MailChimp. Higher, and more expensive, accounts include multiple accounts and reporting. Another transaction management platform, dotloop, announced that 75 percent of Keller Williams Realty’s agents and 16 percent of Re/Max’s are using the service. A similar platform Cartavi closed its first round of venture capital funding in October.